It’s time to celebrate with the ghouls and magical beings! Every year, TrueLogic holds its own company Halloween celebration. 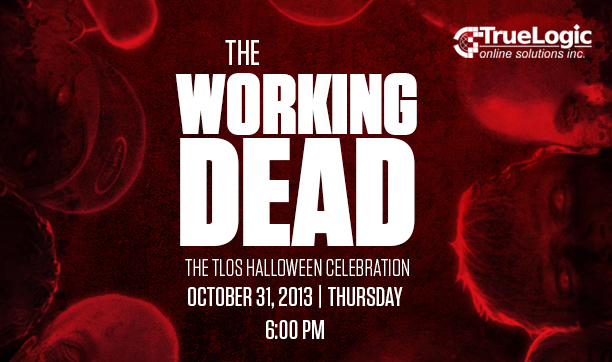 This year’s theme has been announced at the beginning of this week: The Working Dead. The event will take place on Thursday, October 31, 2013 at 6 P.M., from our Town Hall meeting onwards. In line with this, we have prepared two Halloween contests for all our employees to join. We’re posting the rules below for everyone’s reference. There will be food and prizes for all members of the TLOS team who will join. See you at the party! You don’t have to limit your costumes to the “Working Dead” theme. You can be as glamorous, cute, or scary as you want to be. You will be allowed to start putting on your costume/make-up by 3:00pm on October 31, 2013. You should finish your preparations by 6:00pm. Using real weapons or any other items that may cause physical harm as props is not allowed (and building security won’t let you in anyway). Judges (Itamar and Clayton) will select nine finalists based on originality/creativity (50 points) and artistry/craftsmanship (50 points). The finalists will be asked to present themselves to the audience for additional points based on audience impact (up to 20 points). Decorations will be judged per workstation. If you are sharing your workstation with a member of the other shift, you will have to discuss an arrangement and collaborate. You can form teams and coordinate your workstation decorations under a unified theme. The team with the best themed workstations wins a bonus prize. We know we have less than a week to prepare, so you can start decorating as soon as you read this. Table decorations need to be completed by 12nn on October 31, 2013. No major modifications to decorations may be made after the deadline. Do not plagiarize/copy someone else’s idea. Using sharp objects or any other items that may cause physical harm is prohibited. Nails, staple wires, pins, and permanent adhesives that may damage office equipment are prohibited. Walkways should still be accessible. Decorations should not hinder your work. Judges (Itamar and Clayton) will choose the top three workstations based on originality/creativity (50 points) and artistry/craftsmanship (50 points).